Moments like this are always exciting. When I can link together a pair of obsessions. In this case, my most current pair: Scottish beer and Milk Stout. Like Brown Ale, Milk Stout is a tricky bugger to pin down. Because there’s rarely a brewing record with the name Milk Stout on it. The explanation is much the same is for Brown Ale. It’s because it wasn’t a beer brewed specifically, but was another beer tinkered with. Presumably brewers added lactose to their standard Stout at racking time. It’s what Whitbread did with Mackeson, so why wouldn’t everyone else? Then you have William Younger. Who liked lactose so much, they used it in several of their beers, even ones not usually associated with it like Mild and Scotch Ale. But they did throw it into their Stouts, too. You may think that this looks a little strong for a Milk Stout. That’s because in its later days, Milk Stout had all the alcoholic punch of an arthritic granny. But that hadn’t always been the case. 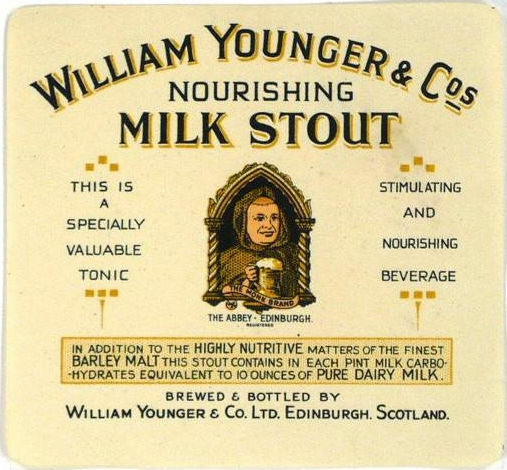 Before WW II, Milk Stouts could be surprisingly strong. For example, in 1929, Mackeson Milk Stout had an OG of 1060º . The grist is typical crazy William Younger. Though, for the period, the proportion of grits is quite low. They had used over 40% at times. A fair dose of English hops leaves it with a respectable level of bitterness. Probably more than you’d expect in a Milk Stout. Though I’m not sure this was marketed as such. Younger did have one in their portfolio, I know because I’ve seen labels, but I don’t know if it was this particular beer. Dry hopping also seems odd for a Milk Stout. But, hey, this is William Younger. They did lots of crazy things. Do you know whether the lactose was added to the boil or at racking time? I'm wondering how it affects the OG and FG. Sorry, I should have paid more attention to your post, not just the recipe. You clearly say that you believe lactose was added at racking time. So I guess it does not affect the OG and FG readings? The licorice addition is interesting. Do you know if they used sticks of brewer's llicorice, that which is available in the homebrew trade, or if they used root or powder? pretty sure William Younger added the lactose in the boil. no idea, unfortunately. Probably whatever was easiest to use.